This book is the first of its kind to discuss in detail the actual management of local animal control programs as opposed to the care of the animals. The book covers those financial, personnel, legal and health and safety issues that animal control directors and management staff need to know in providing direction and oversight of animal control programs. Chapters examine selected topics in which the author assesses the strengths and weaknesses, offers new insights and strategies for managing more effectively. For example, the two chapters on contracting, discuss the steps in the process, strategies, and suggested provisions in the written agreement to make the program more effective. The animal law chapters explain the basis for the laws, but also highlight those provisions that if enacted into law, can strengthen enforcement options. The chapter on budget and revenues explains funding variations among programs and how local officials have been creative in financing these programs. Subjects addressed in this book include many recently recognized as vital to the management of animal control programs. They include: need for websites, use of program evaluations, and the value of forms, records and reports. 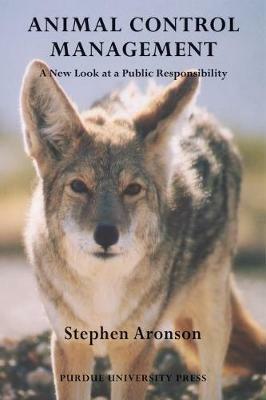 In addition, the author discusses and assesses from a new perspective: interacting with the public and the media, liability issues, wildlife problems, and the politics of animal control. Stephen Aronson has more than 20 years experience in oversight and contracting for local animal control services. Preparation of this book is based on extensive research by the author including interviews with numerous animal control officials in many states.